Jess Anderson, was born near Florence, Nebraska. His step-father beat Jess with a braided strand of barb wire. 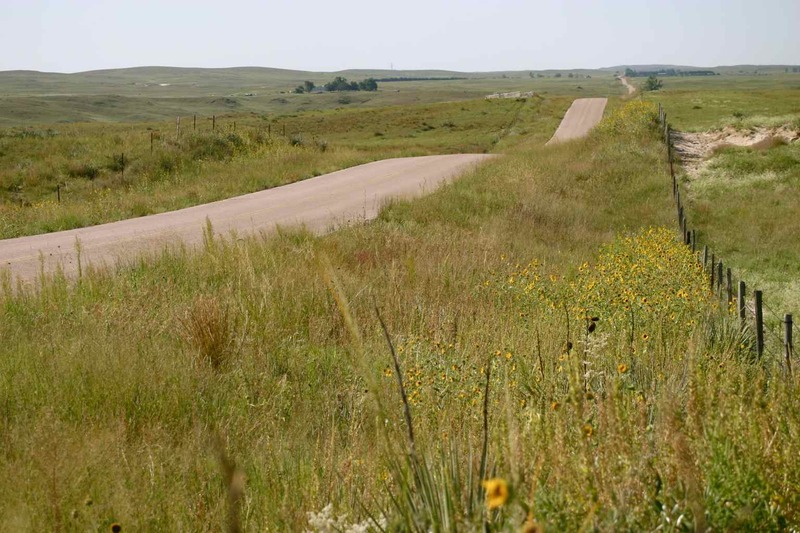 Jess carried the scars to his grave, but when fourteen years old he ran away from home and made his way to McPherson County where he became a cowboy. He worked on several spreads including the holdings of Cap Haskell. Gertie Calkins Anderson, was born near Wymore, Nebraska. Jess and Gertie married, homesteaded and had seven children while living in the county. 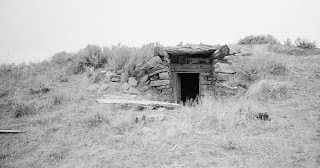 An example of a dugout shelter. Jess continued to work for neighbors while proving up his homestead. The depression in the thirties caused him to lose his homestead and all of his other possessions. They moved into a corn crib on the Seiler place while Jess improvised a shelter into the side of a hill in the southwest part of Tryon. This house would be considered energy efficient now but didn’t prove to be very good at that time. It only had one window, one door and a dirt floor. They lived in it for about nine years and several of the children have had ailments which can probably be attributed to that house. The five oldest Anderson children received all of their formal education in McPherson County. While living on the homestead they attended School District #22 which was three miles across country. They walked to and from school, stacking and bunching cow chips as they went. On weekends they retrieved these chips with a team and wagon. The cow chips were their primary fuel supply. Iris Pennington is the oldest child. She spent several years in a TB clinic and eventually had to have one lung removed. She later fully recovered, married and raised a daughter. Jack Anderson was the oldest boy. He entered the United States Army soon after the Japs bombed Pearl Harbor. Jack served in the European theater of Operations, starting in North Africa and going into Europe via the southern route. After being discharged in 1946, he settled in Missouri. Jack hired out to the Missouri Pacific Railroad in the Bridge and Building Department and retired to an acreage near Holden, Missouri in 1983. All of Gertie and Jess’ children have traveled extensively, but the third child, Enid, got a head start. While they were living on the homestead southwest of Tryon and at the tender age of two she took off. About nine in the morning they discovered she was gone and at sundown that night she was found near Squaw Creek almost six miles due west. At this time Jess showed how fond he was of his children; he wore out three saddle horses searching for Enid. 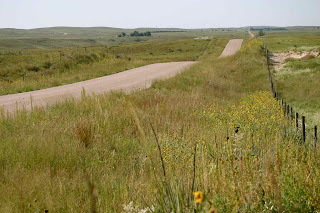 The Nebraska Sandhills - easy to become lost in. Perhaps there are still men alive who will remember this search as it happened in 1924. A crippled man by the name of Kenneth Johnson traveling in a wagon found her quenching her thirst at a pond. One old Cowboy, Charlie Moore said a coyote followed her for a while and he nick-named her the Coyote girl. She didn’t suffer any from this experience as she went on to graduate from McPherson County High School. She married at eighteen and had two children, a boy and a girl. Neil was the next Anderson child. Neil was young when he entered the United States Marine Corps. At the time he finished boot camp, the United States was really taking a beating in the Pacific. Neil didn’t even get to come home on leave before being rushed into combat against the Japs. He was killed by a sniper on Okinawa in 1945. Leon joined the U.S. Navy and served during the latter part of WWII. He saw action against the Japanese in the Pacific. After he was discharged in 1946 he settled near Sutherland. He married and raised six children, retiring from the Nebraska Public Power District. Gene wasn’t old enough to serve in WWII but got in the army during the Korean Conflict. He was wounded in 1951. He recovered and has worked very, very hard ever since. He settled in Sutherland, working on farms and ranches in the area, then working for the Nebraska Game and Parks Commission and as a self-employed carpenter. Keith, the youngest of Jess and Gertie’s kids, went to Missouri when Jess and Gertie moved there in 1943. He joined the Army and served in Alaska. He hired on with the Ford Motor Company and retired from there. Jess was a strict father and if he wasn’t sure which child had created the mischief he whipped all seven. That way he was sure the guilty child got punished. His children all became outstanding citizens so it never hurt any of them. No history of the Jess and Gertie Anderson family would be complete without mentioning a few other McPherson County residents who contributed to their well-being. Kenned Johnson, who averted tragedy when he found Enid after her trip through the Sandhills. Reuel Conroy, when the bank foreclosed on Jess, bought Jess’ milk cow then turned around and gave her to Jess so the kids would have milk. John and Eithel Dahlin who were newly married and very, very poor, but they willingly shared what they had with the Anderson children. I remember our drive with you that afternoon into the sandhills.